Organic Surge hit the Indian market only a few years back. This award-winning brand from UK deals in skin and hair care products that are fully natural and hence free from harmful Parabens, SLS, Artificial fragrances, Colorants and other chemicals that do not suit sensitive skin. This shampoo includes natural actives like organic grapefruit, citrus essential oils (lemon and orange) and natural glycerin that gently deep cleanses your scalp. Your hair is nourished from root to tip making it shiny, bouncy and tangle free after every wash. The refreshing citrusy fragrance calms your nerve. Organic Surge Blissful Daily Moisturizer has the natural goodness of rosemary, sweet orange and lemon essential oils, green tea, grape seed and sweet almond oils. It keeps your skin forever hydrated, is non-greasy and works effectively on sensitive or irritated skin. It works as perfect skin lightening lotion too. Organic Surge Daily Care Face Wash contains Rose geranium essential oil, Aloe Vera and Vitamin E hence is suitable for all skin types from dry to oily to sensitive ones. It helps in removing excess oil from the skin and keeps your face refreshed, hydrated, soft and glowing. 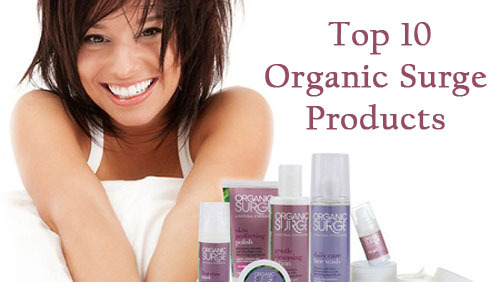 Organic Surge Shine Boost Conditioner works perfectly on normal hair. A unique formulation locks the natural shine of your hair and makes it smooth and tangle free. The conditioner is 100% silicone free and protects the hair from damage caused by environmental pollution. Organic Surge Moisture Boost Shampoo is all about the goodness of Palmarosa essential oil, Seaweed extract and Vitamin E that is the key factor to a manageable, smooth and shiny hair. It also protects your hair from breakage and prevents split ends. Your hair remains naturally hydrated. Organic Surge Tropical Bergamot Body Lotion keeps you hydrated and nourished all day long. It is suitable for all skin types and prevents frequent dryness during arid climatic conditions. The refreshing fragrance soothes your senses and keeps you calm and your skin healthy, beautiful and young. Organic Surge Eye Gel is a unique formulation that comes handy for delicate skin around the eyes. The gel is light weighted and hence gets absorbed fast. It refreshes, cools, rejuvenates and brightens the eye area by reducing puffiness. The goodness of Aloe Vera, green tea, witch hazel, Menthol and Eyebright controls dark shadows. Organic Surge Skin Perfecting Polish acts as a natural exfoliator with its finely grounded walnut shells and apricot stones in a creamy base content. It gently help you get rid of dead skin cells and rejuvenate you skin. You get back your natural glow. The natural glycerin and sweet almond oil is perfect for healthy skin. Organic Surge Fresh Ocean Shower Gel comes with a refreshing fragrance that has the ability to keep you fresh all day long. The gel is naturally formulated with active ingredients that wonderfully cleanse, detoxify, rejuvenate, soothe and moisturize dull and dry skin. Organic Surge First Class Face Mask rejuvenates dull and tired skin also brings back its lost charm. It works on your skin very fast and the non-drying formula further adds on to your beauty. It cleanses your face and keeps it young and healthy. It prevents premature ageing too.